More experts are predicting a strong year ahead for US housing. They see exisiting home sales of 6 to 6.5 million in 2017 and 160,000 new homes being built per year up to 2024. Even without Donald Trump, the market looks good. Interest in rental income investment and apartments is particularly strong now in places like Dallas, Seattle and San Francisco. Whether you’re in Los Angeles, San Diego, San Francisco Bay Area, Seattle, Miami or New York, the outlook is more positive than ever. You won’t find too many US housing forecasts beyond 2016/2017, yet we’re all looking looking ahead to assess which cities to invest in real estate, where to buy a home, and whether this is a good time to sell your home. Check out the report on investments in rental property if you’re planning to buy in markets such as Los Angeles, San Francisco, San Jose, Silicon Valley, New York, Miami, Oakland, Phoenix, Seattle, Denver etc. Buyers are still dreaming in California a good look at the San Diego Real estate market, and the Los Angeles real estate market as economic indicators, and a fresh look at mortgage rates. These stats below collected from top research and reporting companies including NAR, Forisk, Trading Economics, and other real estate market researchers reveal US housing starts and resales are on the rise 2017 to 2020 and beyond. And given the huge Generation Y have put off home ownership and are coming into their key buying years up to 2030, sales of homes and condos are predicted to continue strong well past 2020. 2. Pantheon Macro Chief Economist Ian Shepherdson explains that “Homebuilders behavior likely is a continuing echo of their experience during the crash. No one wants to be caught with excess inventory during a sudden downshift in demand. In this cycle, the pursuit of market share and volumes is less important than profitability and balance sheet resilience.” — Market watch. It’s predicted that new home construction won’t keep up with demand, however it is recovering and we’ll see more renters becoming homeowners over the next decade. Let’s begin with a look at how home prices have grown up to 2016. Nationwide prices are still $50,000 below the pre-recession highs. Will it take 3 to 4 more years to reach those highs? If construction rates do moderate, prices in the hot markets of Miami, San Francisco, Los Angeles, San Diego, New York, Boston, and Phoenix should rocket to all time highs. 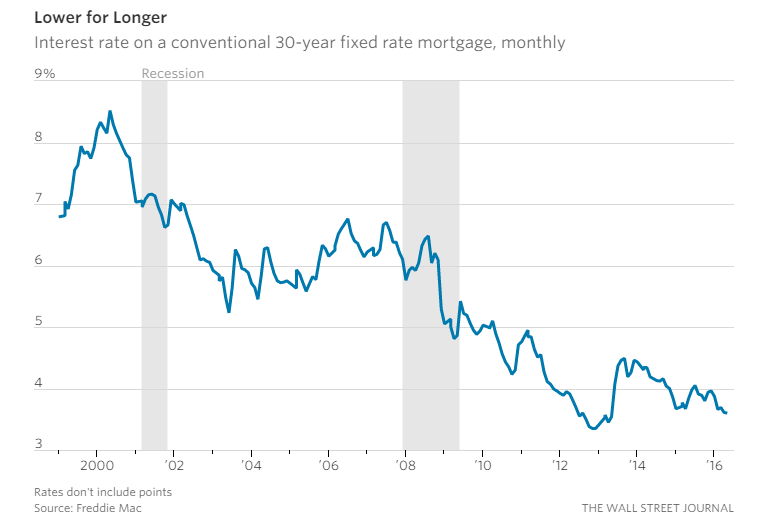 Mortgage rates are forecast to stay low. Yet recently, mortgage rates have risen above the 4% mark and homeowners are locking in their home loans at the 30 year period. Some are calling this the Trump Effect. With Trump in power, lending requirements are expected to be eased, land opened up for development, and this should stimulate home purchases. With employment growing and wages moderating upward, the market is set for growth. Yet, some housing forecasters still cling to the idea that housing starts will moderate after strong growth to 2020.